Simulating or reading thermocouples requires the use of thermocouple or extension grade thermocouple wire. Plug thermocouple wires into the miniature thermocouple jack or place bare thermocouple wires onto the brass block under the screws. The CL543B has two banana jacks (1+ and 2-) mounted in the top end of the housing. These are not temperature compensated and are to be used only for millivolt signals. Simulating or reading RTDs uses copper wire. Plug 2-, 3- or 4-wires into the corresponding jacks on the calibrator. For RTD source the CL543B simulates the (+) RTD from jacks 1 and 4 and the (-) RTD from jacks 2 and 3. 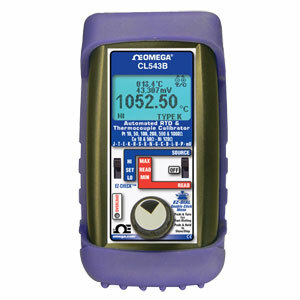 When reading an RTD sensor the CL543B uses patented circuitry to automatically detects if 2-, 3- or 4-wires are connected. This is helpful to troubleshoot sensor connections. Note: Comes complete with NIST Cert (no points), 4 “AA” alkaline batteries, rubber boot, deluxe hands free carrying case,mA/V test leads, 1 red and 1 black lead with banana plugs and alligator clips, RTD wire kit, 2 red and 2 black leads with banana plugs and spade lugs, and operator’s manual.